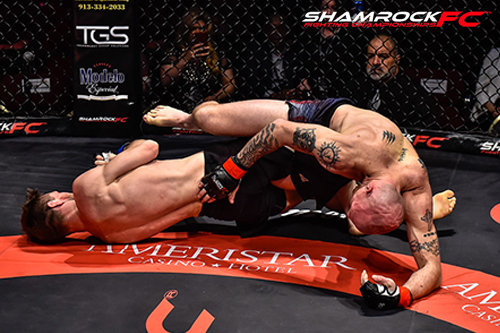 Shamrock FC kicked off its 2019 Kansas City event calendar with a closely matched 10-fight card Saturday night at the Ameristar KC. The event came at a good time with sports fans in KC still licking their wounds on the eve of Superbowl Sunday. The night began with some razor thin decisions and ended with a heavyweight fighting his way back into the cage. The main event between Anthony Garrett and Cesar Gutierrez was a slugfest from the start with each looking for a quick finish. Neither wanted to be in the cage for very long but neither wanted to give up as both looked to land one big shot. The fight started with both men squaring off in the center, punching it out, but after the initial flurry both men slowed. "I honestly felt like I had an adrenaline dump," Garrett said. "I felt great going in, but once I got in there my nerves got to me. I kind of just like dropped. I caught myself not breathing a lot. I haven't been training with my mouthpiece in. I need to start wearing it, even when I'm lift weights and run, and stuff. I haven't fought in a year, and I haven't had it in in a year." Garrett had been sidelined for more than a year with illness and injury, and the ring rust took its toll. Garrett proved his nickname "Lionheart" on the night as he persevered through the initial onslaught taking Gutierrez to the ground and controlling the fight from there. At the end of the first round both were slow to reach there corners. It looked like the next good shot would end the fight as Gutierrez didn't leave his corner initially when the bell sounded for the second. Garrett moved across and they had a short exchange with Garrett landing a couple of shots before Gutierrez went down and referee Mike England stopped the fight 7 seconds into the second round. "We hit each other. I felt his hands land and my lands land, but we didn't have much left," Garrett said. "We both just gave it all we got, and I tried to finish the fight as quick as I could because my gas tank was on empty." Garrett was honest in his assessment of his performance but also confident about the future. He had a lot to fight for recovering from illness and injury, and celebrating a new baby. Garrett is on a mission to not only return as fighter but reinvent himself as a new improved fighter. "I recently had a baby, little Lucy born on January 8th," Garrett said. "I love her to death, and this win is for her, for my daughter Lucy." Nick Radtka and Garrett Wells were the co-main event. These two had previously met in a grappling only event with Radtka prevailing. Most expected Wells to keep the fight standing given the history of the two. Wells dismissed that as "mind games" stating it was important to him to grapple with Radtka and finish the fight with a submission. Radtka started the fight with leg kicks and staying well covered up looking for an opportunity for a takedown. Wells defend a couple of attempts but Radtka successfully completed a takedown midway through the first. Wells controlled the hips of Radtka while throwing elbows from the bottom. Radtka moved to transition out of Wells' guard. During the transition Wells took an unprotected leg. Radtka tried to roll out but Wells continued to attack the leg securing a kneebar submission at 3:45 in the first round. "I was looking for the submission the entire time." Wells said. "He tapped me out in a grappling tournament last year so this was really important for me to get it back and I felt it had to end in a submission,"
After losing his first two as a pro, Wells picks up his second win in a row. "I'm looking forward to going out there and keep putting on a good show, submission is my game, so lets keep doing it." Well said. With each man having taken a win off the other, a third bout could be in the works. "That kinda sets up a rubber match," SFC Matchmaker Rob Donaker said. "When you have two good grapplers, jiu-jitsu or wrestling, most of the time they end up a striking match because of the mutual respect. With this one, they traded a little bit and went right to the ground." Shamrock has been presenting female fights for a while now and they always generate excitement. The level of competition has matured as the number of fighters has increased. Saturday night 3 out of the 10 fights were women, and they were three of the most exciting fights of the night. The fan reactions as the fighters were announced showed the fighters aren't oddities. These fighters are attracting their own fans and bringing them to the shows. Katelyn Radtka earned her first victory over Krista Camarillo with a nice armbar to find victory in the 1st round. "I was going to try and keep it on the feet, but she gave me an opportunity and I'm very comfortable on the ground," Radkta said. "After this I'm going to spend some freakin' time with my kids, do some jiu-jitsu and I'll be back, maybe in March." Lainey Nations is on a two win streak with her victory over Stormie Kilgore. Nations is looking to turn pro after one more fight. In the third of the trio of women's matches, Haylee Woodward defeated Adrienne Brusca in a kickboxing match with one of the three split decisions of the night. "Everybody always tells me 'we've got to have at least one women's fight' because everyone loves it, tonight we had three." Donaker said. "I think they did still the show. Most of the kickboxing with women they're going to go the distance, but they're going to fight, they're going to throw punches and hit each other and it's going to be non stop. With Lainey, people love her. You can hear it in the crowd, she gets out there and markets herself. Her and Katelyn, you could hear it when they were announced, the women are starting to take over." 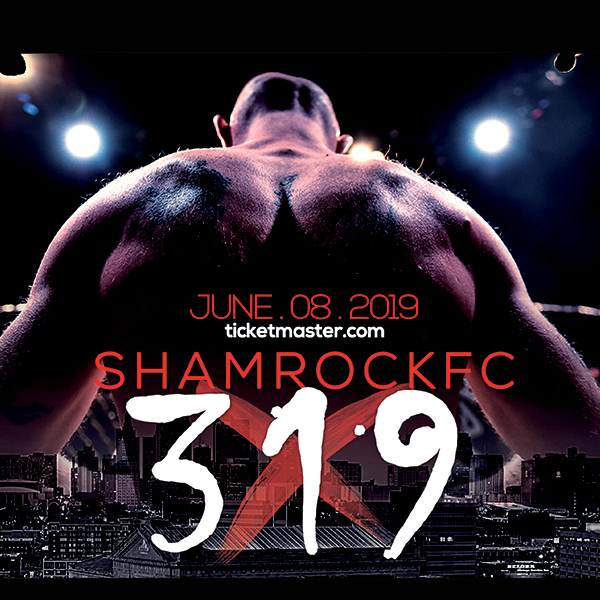 Shamrock FC will return to KC on April 6th for the second of six shows for 2019. Photos courtesy of Jerry Chavez Photography. See the entire gallery here.